This is an actual surviving classic Bollywood film poster of the 1996 romance that starred superstar Aamir Khan and Karisma Kapoor in lead roles. Printed and circulated several years after the first release of the film (somewhere in the late 1990s / early 2000s), this classic Raja Hindustani poster was printed for publicity of the film but never ended up being used. Raja Hindustani was declared an “All Time Blockbuster” and became one of the highest grossing films of the 1990s. The film's soundtrack album sold over 10 million copies worldwide, making it one of the bestselling Bollywood soundtrack albums of all time. Songs from the film, most notably “Pardesi Pardesi Jana Nahi” are played till today. Raja Hindustani bagged 5 awards at the prestigious 1997 Filmfare Awards (including the Best Movie, Best Actor and Best Actress awards), making this classic Raja Hindustani movie poster highly collectible! 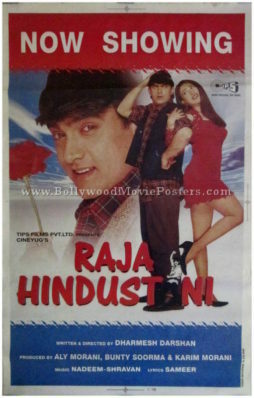 Aamir Khan is seen holding a rose in his hand in a large close up prominently in this Raja Hindustani poster. 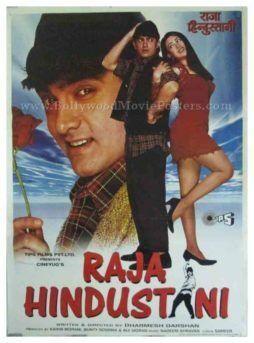 The two lead actors are seen in a romantic dancing still alongside in this Raja Hindustani film poster. Classic Hindi movie poster of the hit Bollywood film, Ghulam (1998) for sale. This is an actual surviving classic Hindi movie poster of the 1998 drama that starred Aamir Khan, Rani Mukerji and Deepak Tijori in lead roles. Printed and circulated during the original first release of the film (late 1990s), this classic Hindi movie poster was printed for publicity of the film but never ended up being used. Songs from the film, most notably “Aati Kya Khandala” sung by Aamir Khan and Alka Yagnik became a rage throughout the nation and are played till today, making this classic Hindi movie poster highly collectible! Ghulam was awarded the Best Scene Award at the 44th Filmfare Awards for a memorable sequence in the film in which Aamir runs on a railroad track towards an oncoming train, jumping off the track at the last minute when the train is only a few feet away from running him over. Aamir Khan reportedly performed the dangerous stunt himself – jumping off the track with a narrow margin of only 1.3 seconds to spare. 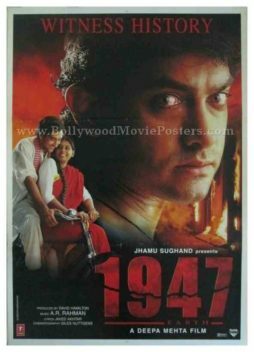 Aamir Khan is seen prominently in a close up with his fist tightly clenched in this classic Hindi movie poster. 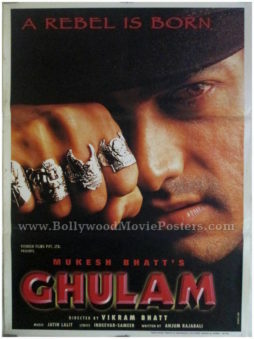 Aamir Khan movie poster of the hit Hindi film, Ghulam (1998) for sale. 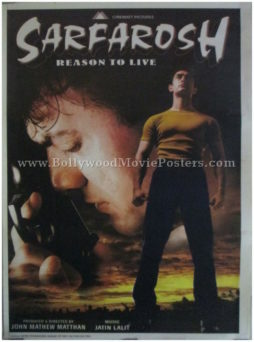 This is an actual surviving Aamir Khan poster of the 1998 drama directed by Vikram Bhatt that starred the actor in the lead role opposite Rani Mukerji. Deepak Tijori played a supporting role in the film. 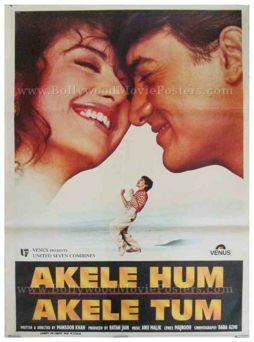 Songs from the film, most notably “Aati Kya Khandala” sung by Aamir Khan and Alka Yagnik became a rage throughout the nation and are played till today, making this Aamir Khan poster highly collectible! Printed and circulated during the original first release of the film (late 1990s), this Aati Kya Khandala poster was printed for publicity of the movie but never ended up being used. This Aati Kya Khandala poster capitalizes on the huge success of the song. The lead couple Aamir Khan and Rani Mukerji are seen in a playful pose from the song in this Aati Kya Khandala poster. Aamir Khan’s thumb seems to suggest that he is asking Rani Mukerji out on a weekend trip to popular hill station Khandala. The opening lyrics of the hit song are written in a musical font on the top of this Aati Kya Khandala poster. 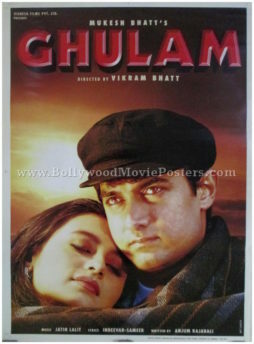 Classic Indian film poster of the hit Hindi movie, Ghulam (1998) for sale. 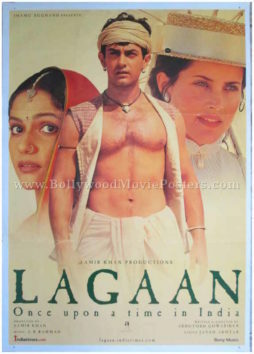 This is an actual surviving classic Indian film poster of the 1998 drama that starred Aamir Khan, Rani Mukerji and Deepak Tijori in lead roles. 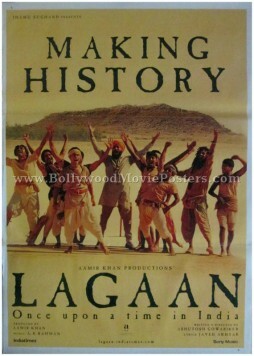 Printed and circulated during the original first release of the film (late 1990s), this classic Indian film poster was printed for publicity of the movie but never ended up being used. Songs from the film, most notably “Aati Kya Khandala” sung by Aamir Khan and Alka Yagnik became a rage throughout the nation and are played till today, making this classic Indian film poster highly collectible! 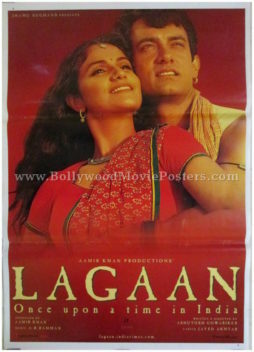 The lead couple Aamir Khan and Rani Mukerji are seen in a passionate close up on the top and as a dancing couple in a smaller photographic still at the bottom of this classic Indian film poster. Classic Bollywood poster of the hit Hindi movie, Ghulam (1998) for sale. This is an actual surviving classic Bollywood film poster of the 1998 drama that starred Aamir Khan, Rani Mukerji and Deepak Tijori in lead roles. 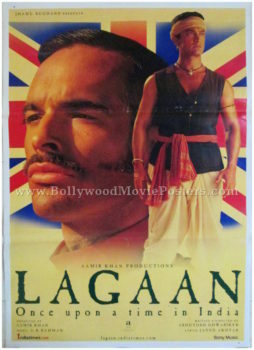 Printed and circulated during the original first release of the film (late 1990s), this classic Bollywood movie poster was printed for publicity of the film but never ended up being used. Songs from the film, most notably “Aati Kya Khandala” sung by Aamir Khan and Alka Yagnik became a rage throughout the nation and are played till today, making this classic Bollywood poster highly collectible! The lead couple Aamir Khan and Rani Mukerji are seen prominently in a romantic photographic still in this classic Bollywood movie poster. Old Bollywood film poster of the Hindi movie, Deewana Mujh Sa Nahin (1990) for sale. This is an actual surviving original Bollywood poster of the 1990 romance that featured one of the most influential actors in modern Indian cinema, Aamir Khan in the lead role opposite Madhuri Dixit. 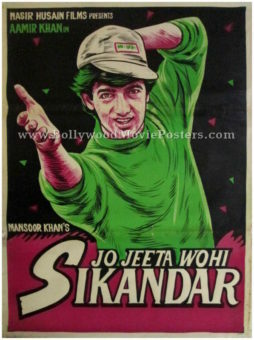 Printed and circulated during the original first release of the film (late 1980s), this Aamir Khan poster was originally designed for publicity of the film but never ended up being used. This Aamir Khan poster has been designed by the greatest calendar artist in India, JP Singhal and bears his printed signature in the name of his studio “Singhals” on the bottom right hand corner. This Bollywood poster for sale is an excellent showcase of noted calendar artist JP Singhal’s collage skills. Stunning large close ups of Madhuri Dixit wearing retro sunglasses and Aamir Khan appear on the top. Photographic stills from various songs in the film are seen below. The title song of the film, “O Jaane Jaana – Deewana Mujh Sa Nahin” became an instant hit and is fondly remembered and played till today. Buy classic Bollywood posters of the old Hindi film, 1947 Earth (1998) for sale. 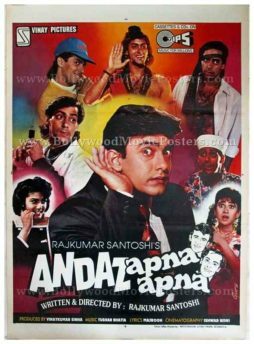 This is an actual surviving classic Bollywood poster of the 1998 period film that starred Aamir Khan and Nandita Das in lead roles. 1947 Earth was India’s official entry for the Academy Award for Best Foreign Language Film, making this poster highly collectible! Printed and circulated somewhere in the late 1990s, this classic Bollywood poster was printed for publicity of the film but never ended up being used. 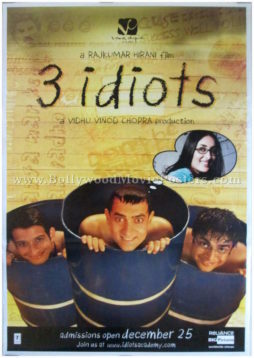 The three lead actors are seen prominently in photographic stills in this glossy Aamir Khan movie poster. 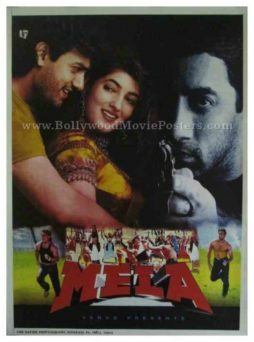 Classic Bollywood poster of the old Hindi film, Mela (2000) for sale. This is an actual surviving classic Bollywood poster of the 2000 action drama that starred Aamir Khan along with his real life brother Faisal Khan. 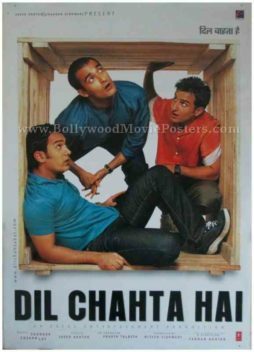 The three lead actors are seen prominently in photographic stills in this Aamir Khan movie poster. Classic Bollywood movie poster of the blockbuster Hindi film, Rangeela (1995) for sale. This is an actual surviving classic poster of the 1995 love triangle starring Aamir Khan, Jackie Shroff and Urmila Matondkar. This was ace music composer AR Rahman’s (Of Slumdog Millionaire fame) first Hindi film, for which he won several awards, making this poster highly collectible! Printed and circulated a few years after the first release of the film, this classic Bollywood movie poster was originally designed for publicity of the film but never ended up being used. 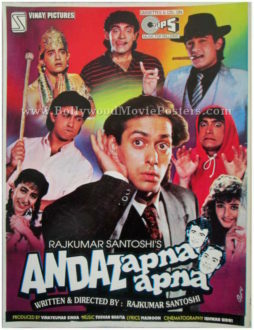 This poster features the three lead actors, along with a small mugshot of AR Rahman encircled with the text, “AR Rahman’s first original Hindi music”. The typography used in this poster is entirely in English. 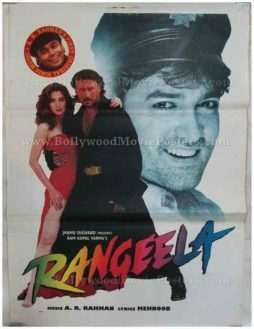 Rangeela (Colorful) is a 1995 blockbuster Hindi film starring Aamir Khan, Jackie Shroff and Urmila Matondkar. Centered around a love triangle directed by Ram Gopal Varma, the film was AR Rahman’s first Hindi film in which he composed an original score. He would later go on to win several awards for his music and gain a cult following in Bollywood. The blockbuster bagged numerous awards and is remembered till date for AR Rahman’s brilliantly composed songs. Chart toppers like “Rangeela Re”, “Hai Rama”, “Kya Kare Kya Na Kare”, “Tanha Tanha Yaha Pe Jeena”, “Yaaro Sun Lo Zara”, “Mangta Hai Kya” & “Yayi re Yayi Re” are some of the finest songs ever composed in the recent history of Bollywood.